As far back as my memory serves me, I was a creative. Family says I was born with a crayon in my mouth. Drawing, building things, making pictures with crayons were an everyday staple in my early childhood. While hospitalized in the eighth grade for some respiratory problems, an Aunt gave me a paint by number set. I did the painting and when it was dry I turned the panel over and did my own painting with the leftover paints. That started my passion for painting in oils. Marco Lolo Marchi was my high school art teacher and he fanned those flames of creativity in me into a blaze that still burns brightly today. He entered my work in the New England Scholastic Arts Awards program, the most prestigious recognition initiative for creative teens where I was awarded a Blue Ribbon, Best in Show and a Regional Gold Key for artistic excellence out of all works submitted from the five New England States. It was set, there were no other alternatives, against the advice of family and friends I was going to be a professional artist no matter what the obstacles. At the Art Institute Of Boston, (1968 to1971) I majored in Editorial Illustration and minored in Photography. The Fine Art department did not offer what I wanted. I was focused on realism and the Fine Art Department, as in most art schools of that time, emphasized abstract expressionism. I had no desire to splash, drip and throw paint at my canvas, I wanted to create the illusion of three dimensions on a two dimensional surface in the tradition of the Old Masters. I spent all my spare time studying master works at the Boston Museum Of Fine Art. I continued to learn from Marco while, working in his art gallery in the Greater Boston area during my studies at the Art Institute Of Boston. I consider Marco the greatest art mentor in my life. I remain in contact with him to this day. What made my art career possible was the full support my wife gave in my decision to become a professional artist. She married me with my senior year still ahead of me at the Art Institute Of Boston. I do not think that my passion for art could have survived the many unique hardships that come when one is building a career in the fine arts field. The lonely study, the practice, the endless hours trying to unravel the mysteries of art, years spent gaining experience in seeing and decades spent sharpening one as technical skills are the price one pays for a field in which few, given the number of those pursuing art, find sufficient financial independence. She knew this and has worked tirelessly with me taking care of the 'business end' of our fine art enterprise. Within a year of finishing my studies, my wife and I opened the Tradewinds Gallery in East Gloucester Massachusetts. While living on an oceanfront estate with the Atlantic just 40 feet from my front door, my passion for the sea grew and I became intimately familiar with capturing the many moods of the sea along with it's complex wave dynamics. A few years later I began exhibiting in juried art shows along the northeast. We moved from living right on the open Atlantic in East Gloucester, Massachusetts to the lush Green Mountains of central Vermont. New subjects to explore in the mountains! My base of loyal collectors grew year by year and galleries began asking to represent me. Invitational shows followed at several Museums in the Northeast including the New York State Museum (1888-1989). Publishers sought out my work for limited edition prints and over 12,000 prints were sold in Canada. Three galleries in Switzerland represented my sculptures in porcelain. Commissions for custom came in and I worked long hours in my studio pursuing my passion. ABC's nationally televised Good Morning America Show did a segment on my work in 1998. Hiking in the wilderness provided the inspiration to create art that reflected the chaos and beauty of untamed areas. 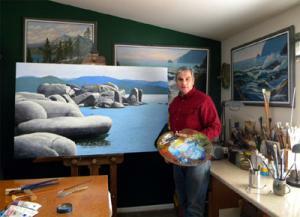 The forests, mountains, rivers and streams around me fueled my passion for painting and sculpting. I was living the dream I had since the eighth grade. In 2002 we moved to the foothills of the Sierra Nevada Mountains in Northern California where, with my son and hiking partner, Adam, discovered the breathtaking scenery in the Sierras. In my hikes and explorations I was deeply moved by the glorious majesty of the western mountains with so much bare rock, such great heights and wide panoramic vistas! Lake Tahoe and the surrounding mountains became a favorite area for inspiration. Mural commissions came in from cities, businesses and private homeowners. Galleries represented my works in Gouache (an opaque watercolor) and oils. To keep up with the demand for my work I began offering prints of my work on a variety of surfaces and sizes. My websites opened new opportunities for me to connect with collectors worldwide. I am amazed that my records show that my work is in collections in dozens of countries on five continents! My passion to create still burns hotly today and my creative output remains very high as I continue to capture in paint and pixels the glories of the natural world that inspires me. Frank Wilson ~ Member of the International Guild Of Realism. Inducted into the Grumbacher Artist Hall Of Fame. ARTIST STATEMENT 'My aim is to provide the visual stimulus to reconnect with nature, to renew body, mind and spirit through the imagery that I capture of the natural world with paint and through my lens. I hope that you find an image in my collections that will enhance your life." The sea has always had a special allure for me. For many years my wife and I lived right on the open Atlantic out on Eastern Point in East Gloucester Massachusetts. There were 30 foot high cliffs that the pounding surf would strike sending plumes of seaspray high into the air. Harbor Seals sometimes basked on the rocks in front of our home. Tidepools provided endless opportunities to learn about starfish, crabs, mussels, barnacles, hermit crabs and other life forms of the intertidal zone. But the most magical thing about living directly on the open ocean was the moods of the sea itself. Sunrises that revealed a glassy calm sea, seeing the moon rise with it's long shimmering reflection, violent storms and everything in between gave me firsthand knowledge of the immense power and moods of the sea. I studied the action of waves, took notes on weather conditions and painted the sea. Those early paintings, done from direct observation, have burned into my mind the dynamics, movement and ever changing colors of the ocean. Although I have spent most of my life living in the mountains of Northern Vermont and Northern California, I have never forgotten the lessons I learned from living right on the sea's edge. I still create seascapes of both the Atlantic and Pacific Coasts, drawing on the knowledge I accumulated from my intimacy with the ocean. It is my hope that you can sense my love of the sea through my art. Prints are available in amny sizes and media for your decorating needs. Thank you for you patronage and enabling me to continue pursuing making art! Frank Wilson ~ your "Painter Of Dreams"
From what I have seen in all my years exhibiting in museums and fine art galleries, Landscape Painting is by far, the most popular genre in painting. 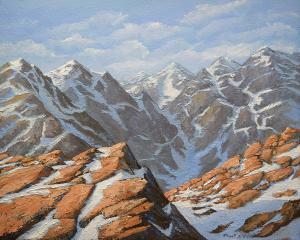 Museums are filled with landscape art, if not pure landscape then as backgrounds for figurative art. I for one love the varied landscapes that I have explored, hiked and photographed. There is something with which we connect deeply with landscape painting, perhaps a certain scene reminds of a trip we made with family or friends. A fond memory can be triggered by viewing a landscape painting. Landscapes present the painter with unique challenges as the composition of the scene can be simple or very complex. Lighting changes rapidly throughout the day and those painting in the great outdoors know that they have to capture the essentials of the landscape quickly before the light changes too much and alters the scene. For studio painters like myself, the composition and lighting scheme must be carefully laid out before painting begins. The decades that I have spent cross-country skiing in the wilderness, hiking and mountaineering has given me a wealth of inspiration that could be the basis for many thousands more works yet to be painted. My mind is a personal treasure trove of mental images that have been stored and filed, much like any picture files that an artist my use for reference. What triggers a desire to paint a certain scene? Often times it is the total experience that I recall, the temperature, the wind, the aromas and fragrances associated with the place. Of course, I cannot paint those things but I can recall how the light reveals the form of the landscape, the colors, textures and perspectives, both linear and atmospheric. Oftentimes the memory is so strong as to trigger my other senses into actually smelling the air that was present when I saw the scene. Sometimes I paint a scene because it has a strong emotional significance to me. Perhaps I was hiking with my son or a friend when I came upon the scene. It has not been rare for me to be overwhelmed and moved to tears when gazing upon a spectacular, beautiful scene. These strong emotions and memories have burned themselves into my mind and serve as the inspiration for many of my best paintings. They compel me to share my vision and experience with others. My work falls into two categories, my "landscape portraits" that are exact representations of a place and time and my "dream scapes" …. landscapes that have taken form in my dreams, often from recent trips. These composite images capture the pure essence of a particular place and time without painting an accurate image of what I actually saw. Because I dream of painting landscapes, and then paint my dreams, my trademark is Frank Wilson ~your "Painter Of Dreams". This ability to dream landscapes first came to me in my early twenties and has grown stronger with each passing decade. I'd be interested in hearing from other artists that have had similar experiences.